For the last few years I have toyed with an idea that’s relatively radical (at least for me): the notion that I don’t need to make jam out of vast quantities of fruit. A small quantity suffices, and I needn’t reach for the pectin packet, either. Sugar and fruit will do. Put a few tablespoons of water into your largest non-cast iron skillet, add and stir the fruit and the sugar: put a lid on it and place the heat on medium. On boiling, remove the lid and let it reduce down, waaay down, over the lowest heat, stirring on occasion so it’s neither sticking nor burning. Once it’s thick, place the lid on it and let it sit overnight (if that doesn’t appeal, place the whole pan in the fridge). Reheat it in the morning. You can scrape the contents out into hot, sterile half-pint jars, place lids on them, tighten, and process (either boiling-water bath, covered by min. 1″ of boiling water, for 20 minutes or in pressure canner for 10 minutes at 10 pounds). I find this works great for mixed fruits. Peach/nectarine/cranberry/ginger, say; or cherry/peach/blueberry, or strawberry/blackberry. Whatever you have. The stuff is thick! and reliably set…and a lot less hassle than jamming, oh, I don’t know, those 20 pints of strawberry jam I made in June. Jam on, people! This method works really well if you don’t eat much of the stuff to see you through the year. This entry was posted in sweet things. Bookmark the permalink. Jam is one of my first canning experiences. I have only used pectin but will give this method a try, especially since the pectin recipes are so specific and state “No Deviation” and the mixed jam sounds so good. Now I’m canning everything and making up relish recipes and it is a whole lot of fun! Lucky me, my generous neighbors gave me the run of their Concord grape arbor this year!! My creativity is stirring! I just started canning jams this summer: Blueberry and strawberry. I’m diabetic and store bought jams now taste too sweet, so I made my own with a lot less sugar. We’re coming into peaches and plums so I will make a few jars of those (brandied peaches and something with plums) and a few pints of salsa over this weekend. It’s nice to have that unique jar of jam for those special occaissions! 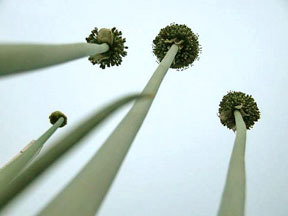 If you want to water-bath can then, you can use an asparagus pot for two half-pints, or one pint jar. Then you don’t have to heat up the big canning pot! Very nice demystifying of one of those seemingly arcane old arts. For myself, after a lot of frustration with jam that didn’t set the way it’s “supposed to,” I finally made my peace with the fact that I make runny jam. I even call it that, blackberry runny jam. Works fine, dripping into the crannies on toast, or as pancake or ice cream sauce. I use 80% sugar to fruit (by weight) and add lemon juice, but otherwise, yes! jam on! (8 1/2 pints figs and 6 1/2-pt lemony peaches today…). Damson’s in the fridge, resting…. I love simple formula-type recipes. I may have been inspired to go make some. Thanks! Couldn’t agree more abt. the small batch choice. I had a hard time shaking the large batches – I think all of those bottles made me feel secure, wealthy! – even though I never had a large enough household to use them all. Gifts got me by and moved them out periodically. Now, settling in to small batches, and doing a lot of it in winter has made a difference. This month I’ve been incredibly busy, so my black raspberries and blueberries ended up as frozen fruit that I’ll turn into jam, jelly and syrup this winter when the pace slows and it’s nice to have the hot stove going! This is the way I normally do it. The one time I tried pectin it was a complete flop. So what you use sugar, it is supposed to taste good! I’m leaning that way for jams, since we don’t use that many over the year, and I’d rather have the variety instead of 8 of the same jars! But, they make great gifts too so the larger yields of the pectin versions sometimes sway me. But I’m in LOVE with small batch pickling and tomato canning! And getting a smaller pot for WB processing is such a revelation to me, ha. Especially in years like this when my tomato crop seems to come in incrementally–it’s so nice to just put up a few jars (today was a smallish salsa recipe and 5 pints of tomatoes). Of course this is also how I ended up with 37 pints of dill pickles last year! I did pectin for years, then decided to try without. I kept overcooking the jam (it was not small-batching, but not large-batching either). Finally figured out how to identify the jellying point. 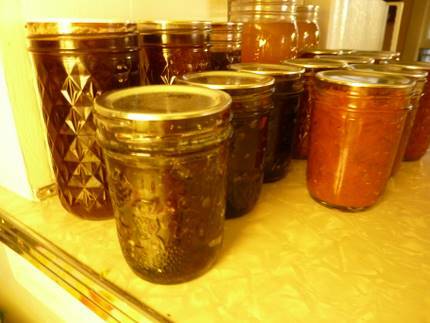 In lieu of pectin, if you have apple trees, or access to them, grate a greenish apple or two into your jam. Provides a bit of natural pectin and acidity to the mix. Sara, 37 pints? Get out! They do add up. What I do like about the large batches of jam is that I always have a few jars to bring as hostess gifts and many to bring to the fall barter. Bartering with others who make different things is even better than small batch canning! Liz, so glad to hear your bounty has led you to try new things! Often it leads to the opposite: same-old or Freak Out. And yes, that’s the great thing about these small batches: feel free to do ANY combo you choose. It’s really all about cooking the liquid nearly out of it: can’t be too syrupy without lots of liquid. JoAnna, my mom is an Atkins fanatic so she does all her (freezer) jams with Splenda. Godawful stuff, that, but she swears it tastes good. (I think it tastes like Drano smells.) So indeed DIY means you’re in complete control, especially with low-sugar requirements. Glad to hear you’re salsa-ing too, isn’t it fun to try it all? Great suggestion, Jennifer! Yeah, even though the canning equipment is fairly inexpensive at Ye Olde Hardware Store, it doesn’t necessarily mean you need to buy it all…thanks for reminding us. Especially if you’re not into feeding an army as I seem hellbent to do. Brett, indeed, I have a whole portion of a shelf devoted to unset jams. Makes fine syrup if you ask me! Cherry syrup is my favorite: don’t spill that I had intended it for jam, ok? Fig jam, Sylvie! That sounds heavenly. And decadent too. Jam on! Hayden, you’re being entirely sensible to wait until winter. I don’t have nearly the sense. 😦 But it is hard, “shaking it,” as you said. I love to give things away too…not everyone makes jam so it’s still a big hit. Nancy, hah! I agree. I understand though about people wanting to avoid the stuff for health reasons…but I don’t, you know, eat a *ton* of jam (or anything sweet really) myself. I do like it when it tastes good though. Sara, well, revelations wouldn’t be revelations if they didn’t sneak up on you. I admit that small-batching was the way I went for years with the tomatoes etc. as I found it just a wee bit more work to keep a pot of tomatoes going at the back of the stove while I made dinner…then I canned them after dinner, leaving the pot sit out overnight. Now, well…with the Loven it’s back to the once a week madness again. Ah well! Karen, you sound like me with my apple/pear mustard. NOT SHARING, ever. MINE. I confess the jelly stage is still a bit of a mystery to me. I think I am just born impatient! Brett, thanks for the pectin tip. I find I love unripe apples in my chutneys. Tangy and thick. I swear though you won’t need the apples in the small-batch process: things thicken quite well if you’re not making a ton of the stuff. But bigger quantities, it’s a fine suggestion. Hah, Annette! Maybe I will pack a couple jars in my bags when we next come to Seattle for one of Tom’s shows (he’s got a gallery there). I wonder if they’ll let me? El if you come to Seattle and don’t alert me I’ll unsubscribe! Do come!!! Hah! Well, I missed the first trip because I couldn’t find someone who wanted to milk my goats! His NY show is coming up soon so I need to get on it…looks like Seattle next year though Annette so I’ll be sure to let you know…don’t unsubscribe, pleeeze!